Printing - Professional Advertising, Product and Commercial Photographer. Printing is an art and I've spent many years getting my prints to be perfect. Over this time therefore, I’ve invested heavily in both time and money to make sure that the quality of my prints are the best they can be, whilst also selecting the finest paper. At the studio, I can print up to A2 and have a carefully chosen selection of paper to ensure my images always look the best. They are all printed using the Canon PROGRAF iPF5100 large format printer, with its unique 12-colour pigment ink system, generating an impressively broad colour gamut. 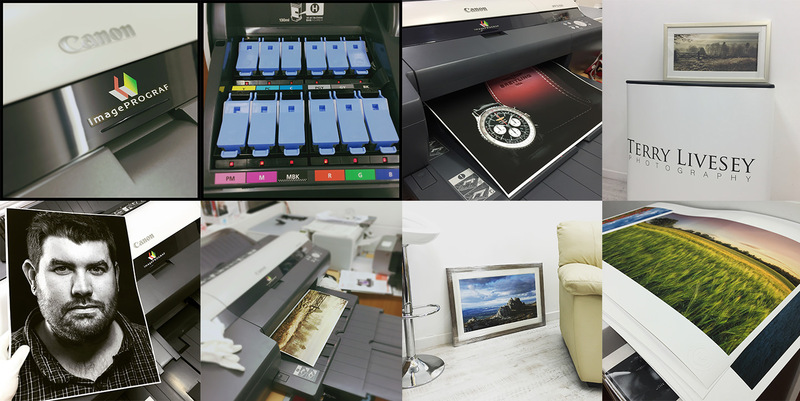 The iPF5100 large format printer features new colour calibration technology and delivers quick, consistent prints that always impress. Well what does all this technology mean for you? It means that I can offer a local printing service tailored to the photographer. The printing that I offer is not designed for everyone, as I will only print a photographer’s original work. So if you're a photographer looking to get a high-quality print done locally, rather than sending it off to a lab and waiting for it to hopefully return in the post, then below are the prices; feel free to drop me a line and we can get your print done. I also have sample prints on each paper in the studio, so if you wish to see what the paper is like, just give me a call and we can arrange a convenient time for you to pop down. Please note this service is for photographers only. A white, 100% cotton paper with a smooth surface texture – guarantees archival standards. With its premium matt inkjet coating Photo Rag® meets the highest industry standards regarding density, colour gamut, colour graduation and image sharpness while preserving the special touch and feel of genuine art paper. Fotospeed Platinum Gloss Art Fibre 300 Paper. Made from 100% alpha-cellulose pulp, Platinum Gloss Fibre 300 is a heavyweight exhibition quality paper and is protected against environmental influence, so prints will last for decades. The paper’s archival quality makes it ideal for professional or amateur photographers who want to create long-lasting images, while its glossy finish and tonal range makes it a good choice for those who don’t want to lose detail when shooting in bright conditions. PF Lustre 275 is a flat, stiff, middle-weight paper with a lustre finish. The paper has a bright white base and an instant dry, micro-porous, coating. This multi award-winning paper’s wide colour gamut and high D-MAX delivers beautiful images, both in colour and B&W. Compatible with both dye and pigment inks. PF Lustre 275 is the cornerstone of the Fotospeed Photo Quality range and should be the go to paper for any photographer. PF Lustre 275 is the perfect combination of quality and price and as a result has therefore been recognised by photographers the world over.